Fred Leebron, a former teacher of mine, is a genius. I don’t say that lightly. The fact is that he blows me away whenever I hear him give a craft talk, which I’ve had the good fortune of doing on several occasions. He’s also an amazing writer–with three novels and numerous prize-winning stories–and I’ve been anxiously waiting for something new from him. 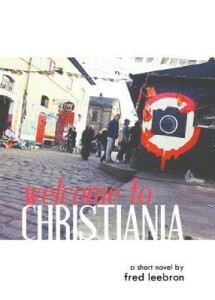 Here it is, in the form of a very short novel set in Christiania, a semi-autonomous section of Copenhagen, Denmark known for its free-wheeling drug culture. The book is dark and weird and fanciful, also disturbing and a bit depressing. I’m glad it’s short so that I can dive back in and see what else I can mine from it on a second read. It’s a symmetrical little book. In the first part, the narrator–about which the reader knows very little–works the streets of Christiania selling drugs for the Big Man. “I am here,” he tells us, “not because I want to be, but because I have to be.” He has traveled all over the world, searching, and this is where he has landed, thinking, at first, that he’d found what he’d been looking for. In the second part, he goes to Spain with his friend Otto to recover from a tragic loss, finding a community, if that’s the right word for it, not unlike the one he’s left in Christiania. And in the third part he returns to the Big Man, only to find that the world he knew has changed. What does it all mean? The narrator is adrift and without attachment. At the outset, he says “Unlike all the other pushers, I have no dog. I am my own dog.” But in the end he says, “I have never been my own dog. Otto is my dog.” Does that mean he’s content to be with Otto as the world crumbles around him? Maybe. Not clear. It’s a quick read. I recommend it. Let me know what you think.